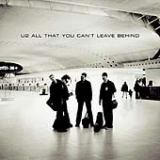 U2 - ALL THAT YOU CAN'T LEAVE BEHIND (CD IMPORT) | Online Shop | Wizard LTD. Album: "ALL THAT YOU CAN'T LEAVE BEHIND (CD IMPORT)"
"Beautiful Day" won the 2001 Grammy Awards for Record Of The Year, for Song Of The Year and for Best Rock Performance by a Duo or Group with Vocal. ALL THAT YOU CAN&apos;T LEAVE BEHIND won the 2002 Grammy Award for Best Rock Album. "Walk On" won the 2002 Grammy Award for Record Of The Year. "Elevation" won the 2002 Grammy Award for Best Rock Performance By A Duo Or Group With Vocal. "Stuck In A Moment You Can&apos;t Get Out Of" won the 2002 Grammy Award for Best Pop Performance By A Duo Or Group With Vocal. Seldom has an album title been as appropriate as ALL THAT YOU CAN&apos;T LEAVE BEHIND. Here, U2 returns to its pre-irony &apos;80s glory days with a straightforward rock approach, leaving behind the electronics and intentional mock-decadence of POP and ZOOROPA. It quickly becomes clear however, that the band had to make those albums in order to get to the ego-free state from which this one emerges. While Larry Mullen&apos;s driving beat, Adam Clayton&apos;s insistently throbbing bass, the Edge&apos;s chiming guitar, and Bono&apos;s soulful vocals mesh as in the days of yore, there&apos;s a less messianic feel to the proceedings that must have resulted from the group&apos;s ego-deflating &apos;90s endeavors. While POP and ZOOROPA were the sound of four guys having fun, on this album U2 manages to combine unpretentious joy with the open-hearted rock power of its early recordings. From the spiritual warmth of "Grace" to the soul leanings of "In a Little While," the band regains the organic quality that had been missing from its music of the previous decade. What sounds like an unusually hands-off approach on the part of producers Brian Eno and Daniel Lanois can only mean that they were smart enough not to fix what was clearly not broken.Rolling Stone (1/4/01, pp.106,118) - Ranked #2 in Rolling Stone&apos;s "Top 10 Albums of 2000" - "...They sound emotional, intense, sincere and full of themselves..."